Mahakosh Lekha Lipik Lekhpal Clerk DAT Admit Card 2019: Mahakosh Maharashtra Lekha Lipik, lekhpal/clerk recruitment examination is expected to be conducted in April/May 2019. The admit card or hall ticket for this examination will be issued to the registered candidates few days before the commencement of examinations. 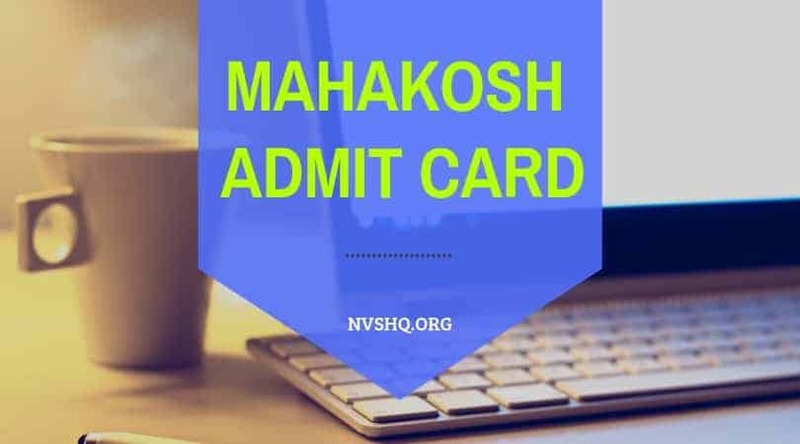 Mahakosh Admit card 2019 will be published online and candidates can download it from the Mahapariksha DAT portal. The admit card dates will also be notified through this portal. Therefore, all the candidates should regularly visit the portal for all the new updates regarding this examination. Through this DAT recruitment drive, 932 vacant posts of Junior Accountants, JuniorAuditor, Account Clerk, Audit Clerk, etc, will be filled in the Directorate of Accounts and Treasury, Maharashtra. 2 How to download Lekha Lipik Lekhpal admit card 2019? Mahakosh Lekha Lipik Lekhpal or clerk Recruitment examination is likely to be held in April/May 2019. It will be an online exam and exams for all the three posts is supposed to be help on different dates. Mahakosh Hall ticket 2019 will be issued only to the registered candidates at least one or two weeks prior to the date of examination. It will be issued on the official website of the examination authority as this is the only medium to get admit card. No physical admit card will be dispatched to any candidate through post or any other medium. Candidates can take printout of the same using the valid login details. If candidate face any difficulty in generating hall ticket, they are advised to contact the concerned department at least one week before the examination. Similarly, any discrepancy in the hall ticket should be brought to the notice of the examination authority on time. Candidates are also advised to download and print the admit card on time. They should not wait for the last date to download the admit card as various issues may arise at the last time. They must take multiple printouts of the hall ticket, in case one gets damaged or miss due to any reason they can use others. How to download Lekha Lipik Lekhpal admit card 2019? Admit card for this recruitment examination is going to be issued through the online mode. Applicants who have successfully submitted the application will only be able to download the admit card from the official portal. Visit the official Mahapariksha portal (www.mahapariksha.gov.in). Enter username and password (created at the time of registration) in the login section. Check the examination schedule, venue, and all the other details mentioned on it. Lastly, download and take print out of the hall ticket. Keep the admit card safe for future reference. Roll number/ registration/ application No. All the particulars mentioned in the admit card will be based on the information furnished by the candidates in the application form. However, candidates may contact the concerned officials in case of any discrepancy in admit card details. All the examinees have to bring their hall tickets positively to the exam center. Along with the hall ticket they also have to carry a valid photo ID proof. Examinees have to carry any of the following valid photo ID proof to the examination hall in original plus photocopy- Voter’s Card/ PAN Card/ Aadhaar card/ E-Aadhar Card with a photograph/ Bank Passbook with photograph / Passport/ Permanent Driving Licence / Photo identity proof issued from a competent authority. Apart from admit card and id proof candidates should not carry any other article/ restricted item to the exam hall. Candidates should note that their name mentioned on the admit card is exactly the same as mentioned on the photo identity proof. Examinee found without valid admit card or id proof will not be permitted to enter the examination center. If you have any query in regards to Mahakosh Clerk or Lekha Lipik Admit Card 2019, then you can ask us in the comment section below.